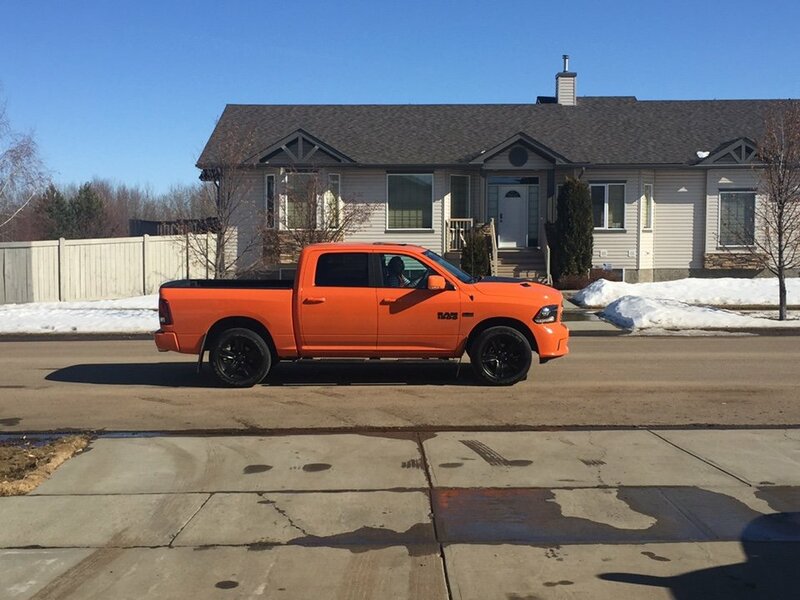 View Poll Results: What make is your primary tow vehicle? The reinforcements between a class 3 and 4 hitch on a f150 seem easy to add for someone looking to add piece of mind and strengthen where a class 3 would begin to fail. It appears everyone of the Ford hitches in that thread is only a class 3. 500# tongue and 5000# weight carrying is class 3 and what is important in our boat applications. The interesting post in that thread was the guy who was towing over the 500/5000# rating and his hitch failed. 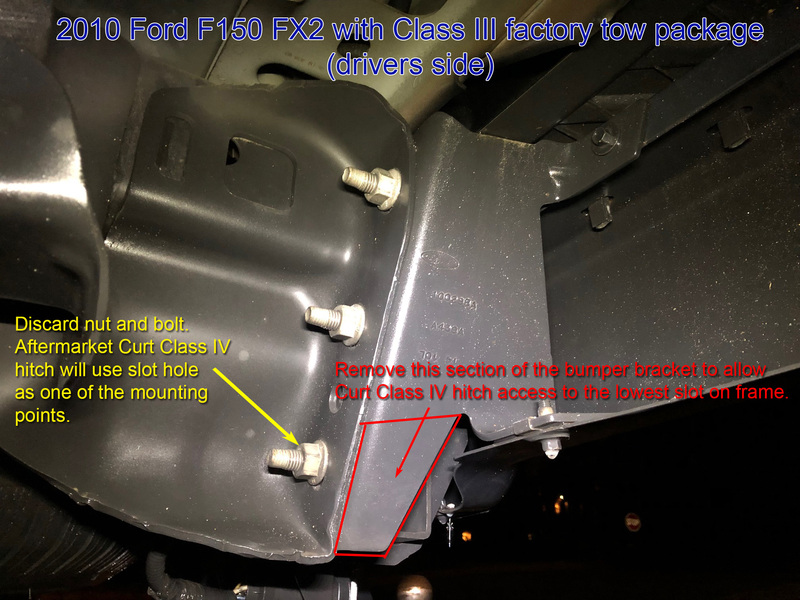 Word is that Ford has corrected the 2019+ hitch and made a class 4 (1000/10000) available. Next time I am at the dealer, I will snap a picture of the hitch tag. We almost bought an explorer sport as another family car, until we learned that Ford cut corners there too. When the IIHS started doing small overlap tests they only did it on the driver’s side. So Ford only reinforced that side of the car. When the passenger side small overlap was released, the Explorer failed miserably. Look it up on YouTube. It’s bad. I’ve been an EMT for only a short time but I’ve seen a couple of these types of crashes, and one was fatal (for the front passenger). I get that companies cut corners to maximize profit, but when they do it with safety (which includes towing) I can’t look past that. 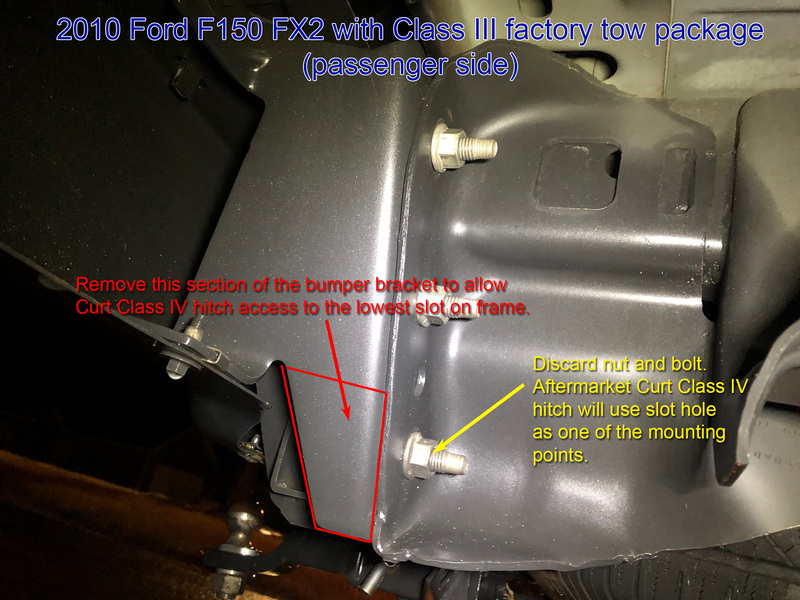 “Ok after going out in the pouring rain I was determined to see if it is indeed possible transform my tow package F150 bumper to a non-tow package F150 bumper so that I could buy and use a Curt Class IV hitch. And the answer is yessir!!! Check it out. 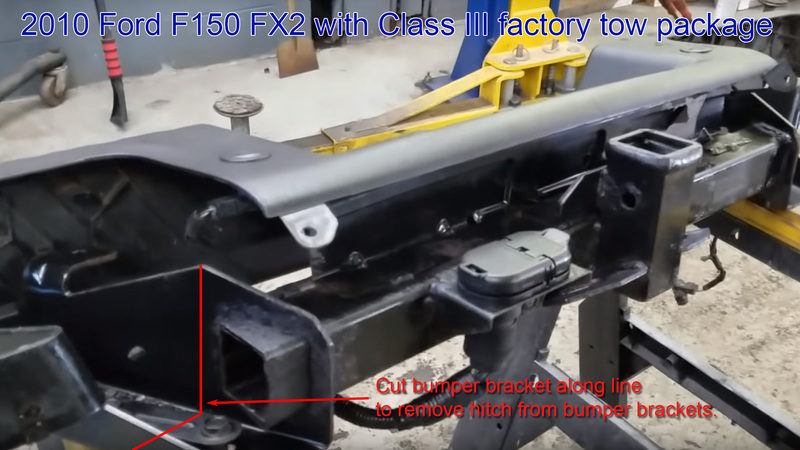 After looking at the Curt Class IV hitch for an F150 without factory tow package I watched their video and noticed the differences between their bumper and the one that comes on a factory tow package F150. 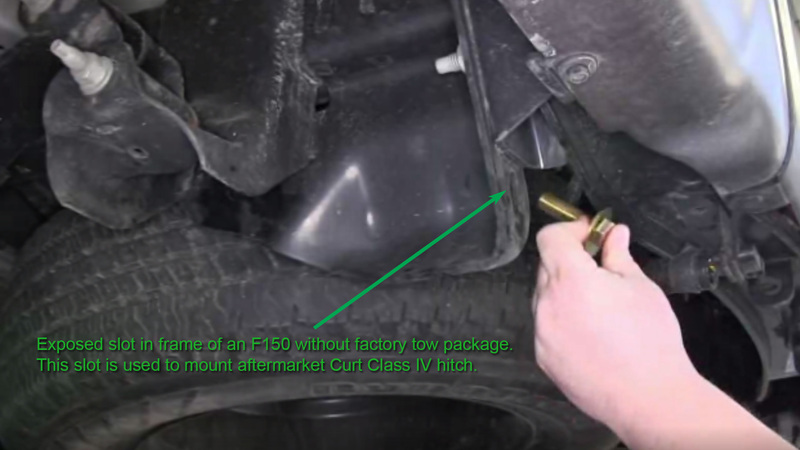 My truck use the lower 3rd bolt where as a non-tow package bumper just uses the middle and upper bolts. This means their bracket is a little shorter than mine which leaves the slot in the frame exposed to mount an aftermarket hitch. The other mounting location they use is up by the top of the spare tire which is fine on either truck package. It's the factory tow hitch and extra bracket material that needs to go...and it's certainly possible. Below I've marked up some screenshots from videos and pics of my truck to explain how I'm going to do this in case anyone else wants or has to do this.